London street style isn't a new phenomenon. The pavements of our capital city have long been dotted with photographers capturing the fashion zeitgeist, from i-D magazine's era-defining straight-ups in the '80s through to documentary snaps of Carnaby Street's '60s mods and rockers. You'll even be able to dig up a Victorian-style snap here and there—even if the focus was probably on the automobiles and industry backdrop, we won't pass up any chance to see a bustle in action. Today you may be likely to find less of the extremely diverse underground tribes that this cultural hub has always been famed for, but there are still style factions present (and many that we draw great inspiration from). London's a place where you can wear your wackiest outfit to breakfast and no one will bat an eyelid. However, it's also a place where you can be ultra-chic and businesslike one day and trend-led the next. Your style can be whatever it wants to be at any given time. And it's true—Brits really do give good outfit inspiration 24/7. That's why we're bringing a new instalment each month of true London street style to Who What Wear UK. Spring 2019 feels like it's happening fashion-wise, even if the weather hasn't caught up yet. 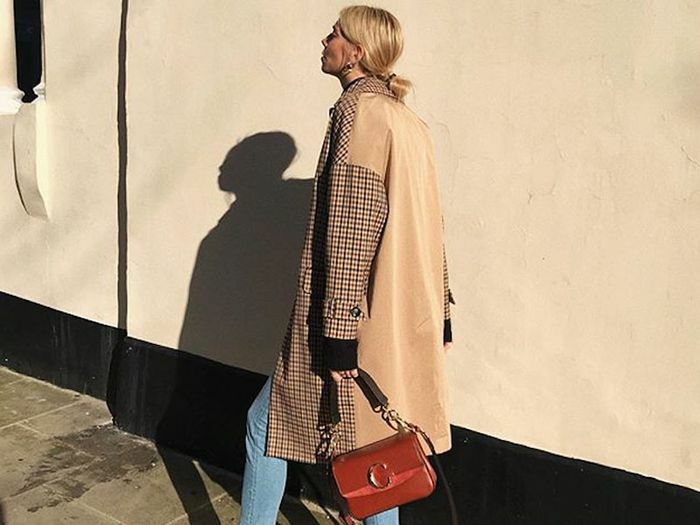 And this past week, everyone appears to have really embraced the change: That meant winter coats were shed in favour of spring jackets, new accessories have replaced old, and right now London girls appear to have a real penchant for jazzy trousers. Keep reading to see great outfit ideas from the sidewalks of this fair city. Style Notes: This green House of Sunny coat has been a trending item on our Instagram feeds, so it's always nice to see something IRL. Student Ella has paired hers with a boilersuit from & Other Stories and sunshine-yellow Converse. Style Notes: Yellow python-print trousers sound mad, but nanny Nandi makes them look casual and easy with her oversized denim and Dr Martens boots. Style Notes: Picking up a bag from Mexico and a top from Australia, Molly (the founder of fashion brand Desmond & Dempsey) makes her outfit all the more unique. Style Notes: You can wear your party dress while out shopping. Mai proves it by layering up with a shearling jacket and wearing her slip with Converse. Style Notes: The eagle-eyed out there will recognise Tora's Maison Margiela "Tabi" boots (they're a cult item). And they look great with the writer's emerald green trousers and this blazer/sweatshirt slouchiness. Style Notes: Graphic designer Sophie has the Rejina Pyo shoes and colour palette of our dreams. Her vintage leather jacket, Lindex bag, jeans and roll-neck all work so beautifully and easily together. Style Notes: Is it just us, or are Converse really popular again? Sales manager Lea has worn hers in a completely different way with white jeans, a silver puffa, purple sweater and cute mini bag. Versatile sneaks. Style Notes: If Karlie got any cuter, or had any more Rejina Pyo pieces to share, we might just burst. She tops and tails her Rejina look with a Celine bag and Gucci shoes. The dream. Style Notes: Neon is already trending way ahead of its big trend moment for spring 2019, but Alexandra makes her green Zara roll-neck work so well for autumn with a trench (H&M), jeans (& Other Stories) and chunky sneakers. Style Notes: Like the coolest girl from outer space just landed on Carnaby Street, singer Daisy is Prada-tastic and impressing us no end with her unique stylings. Style Notes: Teddybear coats are back once again this winter, and still looking just as good. Alexandra's is vintage (who says you have to buy new to have a new trend?). Cute Balenciaga kicks and Hermès bag, too. Style Notes: Can you tell Nathalie is a fashion journalist? Maybe it's the fact she's managed to get her hands on a Shrimps Antonia bag or the expert leather shirt layering (Leon & Harper), the great boots (Jimmy Choo), fab dress (Ganni) or amazing sunnies (Le Specs)? Style Notes: Yes, we managed to find Italian It girl Patricia on the streets of London, and her sporty ensemble didn't disappoint. From her Nike Cortez sneakers to her teeny tiny Chanel bag and Oakley sunnies, this is a comfortable and incredibly cool get-up. Style Notes: The excellent plaid skirt, Chanel bag, hiking trainers and jazzy socks are bold, but Nicola's diffused it all with her excellent J.W.Anderson Uniqlo trench. Style Notes: Iman's studying to be a lawyer but we'd hire her as a fashion expert any day—just look at that awesome pinstripe Topshop suit and the way she's styled it up. It's still available in the sale for £95. Style Notes: You'll notice throughout this gallery that white sneaks are key for any London-based girl. Eneria's no exception, as she's paired her chunky Nikes with the cutest dress from Zara. Style Notes: The coolest way to wear a scrunhie? Loose and low to fasten a ponytail. Style Notes: Hannah's Borgo de Nor dress is truly wonderful as is, but throw in an Hermès bag with a scarf-wrapped handle, Saint Laurent's Lou Lou heart shades, beaded hoops and sweet sandals, and, well, we're obsessed. 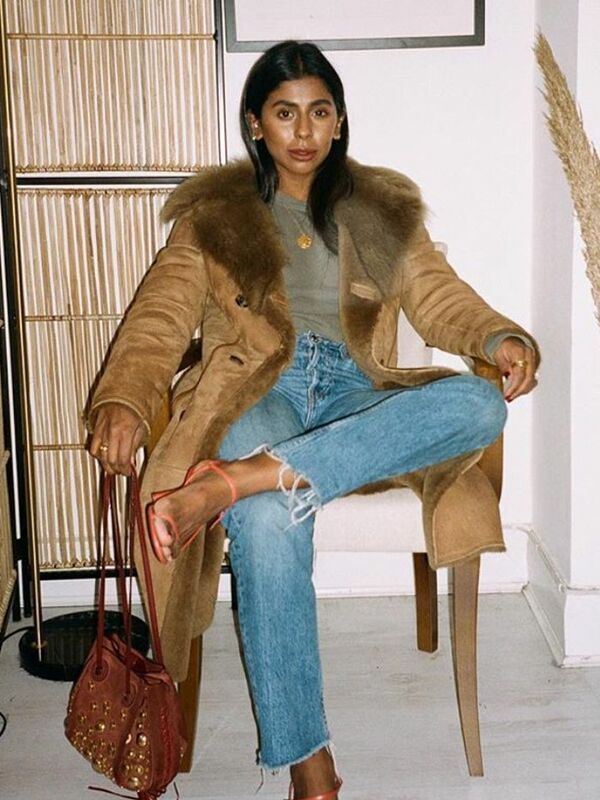 Style Notes: Student Rumbie has definitely persuaded us to ditch skinny jeans some time soon—her baggy Levis look so good with a knotted H&M blouse, Nike sneakers and hoops. Style Notes: Alex's minimalist ensemble is the stuff of dreams: Her Maison Margiela mac, Theory crop top, Chloé bag and Paul Smith skirt are forever pieces, but we appreciate that she loves Zara shoes just like the rest of us. Style Notes: Jo's a personal shopper, which explains how she's managed to find the coolest Topshop polka-dot dress and wear it in the most London way going—with sneaks and socks. Style Notes: Khari is a writer with a wardrobe full of vintage finds—everything she's wearing here has been thrifted and assembled in a unique fashion. Style Notes: How weird is it that we literally just started following Ornella on Instagram before we photographed her by chance on the streets of London? She's a co-ord enthusiast, and this one is from Missy Empire. Style Notes: Student and blogger Tasmine knows the one way to beat depressing weather: colour! Her striped faux-fur Jakke coat is fun as she is, but throw in a red roll-neck, military hat, studded Topshop boots and a Gucci Soho bag, and you'll really impress us. Style Notes: Ekabh got the 2018 memo: Purple is going to be big this year. Style Notes: Model and blogger Maddie Close has made us rethink our party-outfit plans. Her velvet Topshop blazer, baggy jeans and satin boots formula isn't one we'd ever thought of before, but man, it works. Style Notes: Georgia may be a social media consultant, but we'd quite like her to consult on our wardrobes. How great is this black boot (Topshop) + checked jacket (Zara) + denim shorts (Levi's) combo? Style Notes: Claudia works in fashion marketing at Net-a-Porter, so her killer look makes a great deal of sense. Her monochrome pieces (Ellery blouse, Frame jeans and J.W.Anderson bag) look even more effective when set against hot-pink and red Maureen Mules (£435) from Malone Souliers. Jealous. Style Notes: Stylist Barbara has complemented her new-but-retro Gucci sunnies with a host of vintage goodies. Her concise colour palette keeps an adventurous look together. Style Notes: Sophia is a 24-year-old student with a truly creative outlook on fashion. Few of us would think to pair royal-blue socks with tan shoes or a smartly tailored jacket shrugged off to reveal a little shoulder. Also, that Ann Demeulemeester neck scarf is just darling. Style Notes: Pattawee, a student, exemplifies the London fashion spirit: a bit of designer action (hello, Gucci bag), a dash of vintage (her trousers are secondhand) and a little sprinkling of a hot new label (the tee is by Gosha Rubchinskiy). Style Notes: Desislava, a journalist, knows a good trend when she sees one. We're into her double-dose of vinyl. Her trousers (and jacket) are from Acne Studios while the bag is a recognisable number from Christopher Kane. The muted colour palette makes this adventurous fabric combination look easy. Style Notes: Not only has Inês proved it's a great idea to mix 'n' match your frayed denim (Marques'Almeida top and Uniqlo jeans), but she's also proved that it's a good idea to invest in this season's pouch bag trend. The mini-grab style adds a certain cuteness to any grunge look. Style Notes: Sometimes the most random pieces can work beautifully together, as proven by Annabelle, a PR assistant for River Island. How does she ensure the River Island jacket, ASOS jeans, Topshop shoes and 3.1 Phillip Lim bag all work together? It's down to little highlights of colour tying every piece into a unified concept. Style Notes: It's Fenn's concise all-American stars-and-stripes vibe that we dig here. Her Sandro jacket is such a head-turner that really makes the look shine. Style Notes: If you're ever searching for a transitional summer-to-autumn outfit idea, look to communications director Audrey. 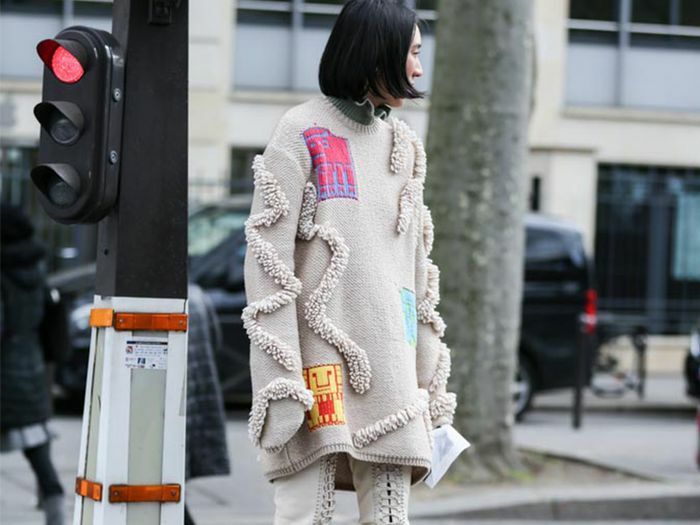 With her chunky Maiyet sweater set against a leg-baring thigh-slit Céline skirt and knee-high boots from Acne Studios, this ensemble has it going on. Plus, a cognac bag (also from Céline) does a nice job of pepping up the neutrals. Next up, the London trends that never die.